Today’s photo is of the Cleveland Skyline in the late afternoon. It was taken from the Columbus Rd. lift bridge which provides one of the best views of downtown Cleveland. Here is some more info about the Columbus rd Bridge from the Cleveland Historical website. 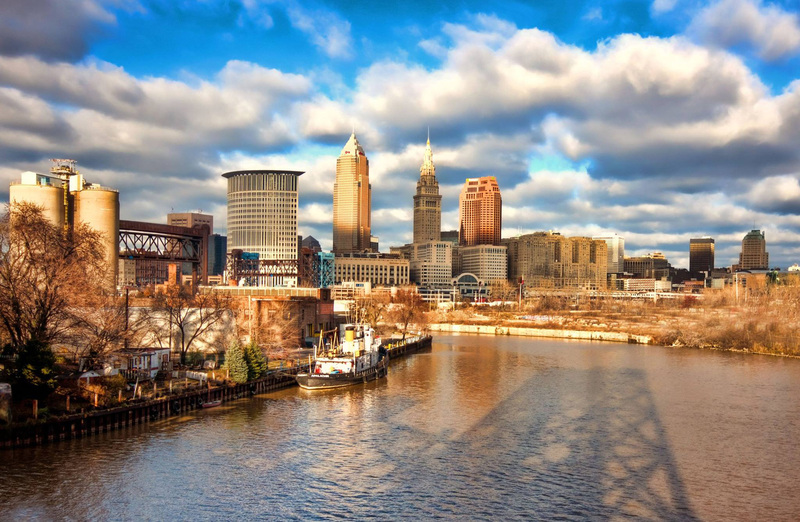 “By the 1830s, Ohio City – a separate city until it was annexed by Cleveland in the 1850s – was falling behind its more prosperous neighbor on the east bank of the Cuyahoga. When a Cleveland land developer constructed a bridge on Columbus Street in the Flats, Ohio City residents were outraged. The new bridge took a southerly route that bypassed Ohio City’s main commercial district on what is now West 25th Street. Given that this new bridge was far superior to the floating bridge further north that had previously been the only span connecting the two cities, Ohio City rightfully feared a drastic decline in traffic and goods moving through their city. Incensed, they decided to boycott the bridge. Cleveland retaliated by removing their half of the old floating bridge. On October 31, 1836, an angry mob of Ohio City residents marched to the Columbus Street Bridge intending to destroy it. Cleveland’s mayor and a number of Cleveland residents met them and fighting broke out, leaving three men seriously injured before the County Sheriff put a stop to the violence. The courts eventually resolved the issue, allowing for both bridges to be opened to traffic.